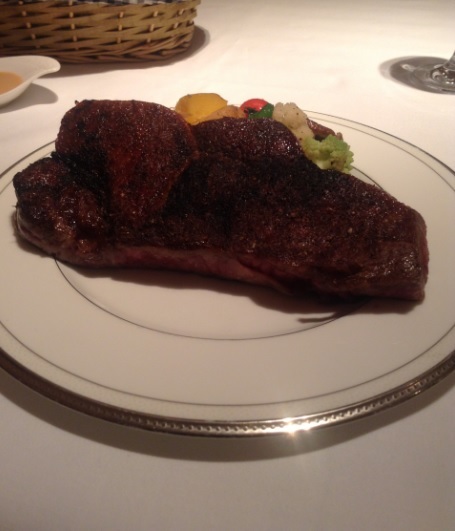 DLN is widely considered as a top tier steakhouse in Tokyo. Service (by the wife of the Chef) was uneven for a 1 star Michelin restaurant: over-the-board friendly with some diners, decent with others…which, I gather, is ‘normal’ in ‘general life’ as this boils down to chemistry between people..less so by the standards of a 1 star Michelin restaurant. That said, rest assured that the service is still really really good (you are in Japan, after all). The quality of the meat is the main reason that brought me here, and there is no denying it: the quality is, as expected, of top shelf mention. Sadly, Wagyu is overrated, which is not the fault of DLN, indeed, but DLN …as a steakhouse…needs to pair better red wine to their steak. 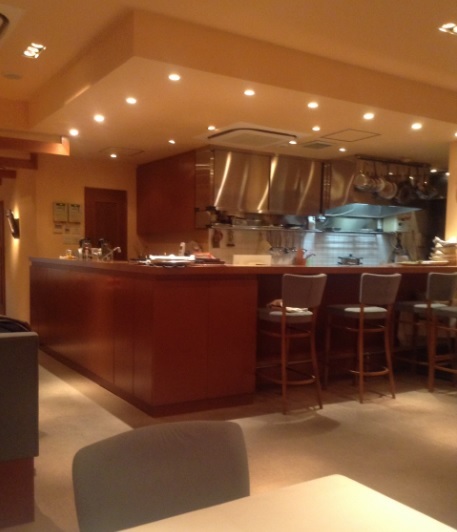 Dons de la Nature is widely considered as one of Tokyo’s finest steakhouses. Which means that, here, you are exempt from the laughable mis-identification of the meat, a sad recurrent feature at plenty of steakhouses around the globe. 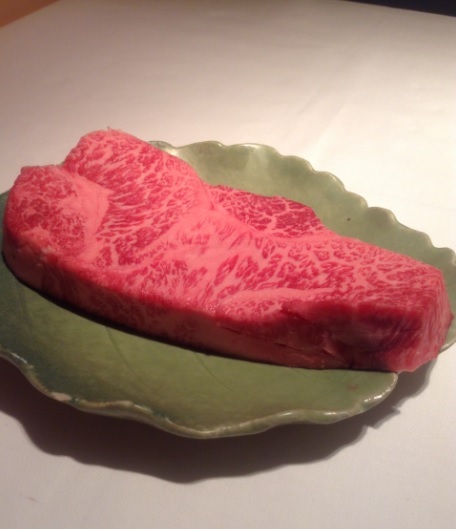 At Dons de la Nature, when they tell you they have Kobe beef, then it is the real one that comes from Kobe in Japan (and not from elsewhere), and when they say Wagyu, then it is TRUE PUREBRED Japanese beef and they will tell you from what region in Japan. Traceability is taken seriously here. Wagyu beef is usually (usually, I wrote, not always) fed on rice straw which is essential for achieving the high level of intramuscular fat as well as whitening the marbled fat. The slaughter occurs in between 23 to 28 months. I took no starter, fearing that the steak would be filling. The meat available on the day of my visit was Wagyu from the Oki Islands, (there was a choice of a highly marbled sirloin, as well as tenderloin — for my taste, Sirloin features the characteristics I am looking for when eating Wagyu as it’s not lean like tenderloin, the flavor certainly more expressive compared to tenderloin). The Chef’s wife has suggested to pair the steak with a glass of Camus Père & Fils Mazoyères-Chambertin Grand Cru 2001. 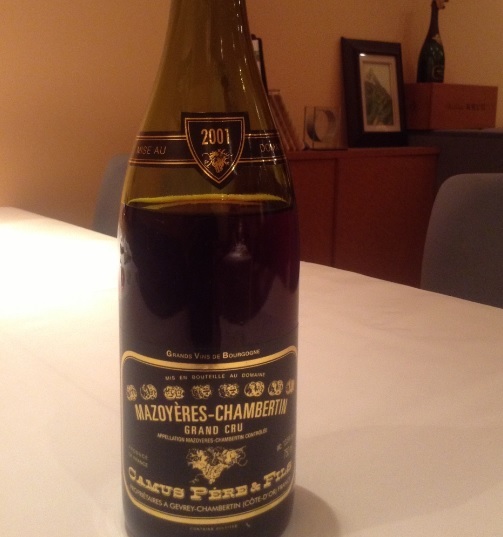 This is a wine that scores high on paper: exceptional soil, exceptional vintage, too, as 2001 is one of the very best years of Mazoyères-Chambertin wine. But the wine I was having had barely any structure (surprising for a wine known for its complexity), the wine devoid of the mouthfeel expected from a grand cru, the finish disappointingly short. Furthermore, this glass of wine was so dry that it clashed with the flavor of the meat I was having. Dryness is a characteristic of Mazoyères-Chambertin wine, but but this was way too dry to be enjoyable. This is an instance where you need a wine with silkier tannins/rounder palate. Pros: Wagyu is so praised outside of Japan that there are no shortage of marketing manipulations to call pretty much everything that looks like meat… Wagyu. You therefore really appreciate the moment when you get to enjoy the real thing on its very own land, which is exactly what Dons de la Nature offers. Cons: Wine pairing to a steak is expected to be a highlight at a steakhouse. It has to. Service: Very intimate, very very friendly. The wife of the Chef (she was the sole waitress on that evening) is very enthusiastic, perhaps more with some than others, but I am nitpicking here. It is much more informal than at most of the steakhouses that I have been to. My verdict and conclusion: I won’t rate this house as I do not want my aversion to Wagyu to influence my opinion about Dons de la Nature. But Wagyu, you my friend….even at the same cost as my favourite Black Angus steaks, there is simply no way I could appreciate you. I respect your legendary reputation but for me, it is clear that your scarcity creates your value. Yes, you are beautiful to espy (I have rarely seen marbling of such striking beauty), but for my palate, you are not even half as flavorful as an expertly dry aged prime cut of Black Angus. And I just gave you 3 chances right here on your own lands! I even ensured to lower my expectations (I had none, to tell you the truth) and I did erase any notion of price from the equation so that the assessment’s focus is on what matters most: the flavor!!!. What I think weeks later: That Wagyu is my all-time biggest disappointment on the aspect of food, that is life and I can deal with that. What struck me most was how the praises about its superlative flavor had absolutely nothing to do with what I have enjoyed. If the flavor of meat is going to be almost as subtle as the one of tofu….then I’ll take the tofu! Meat needs to be flavorful no matter how hard you have worked its quality. GOOD TO KNOW: I can see that this post is very popular among the visitors of this blog. It would, then, be accurate to remember that this post dates from 2013. Since then, many things have changed on the local chophouse scene and some of the steakhouses that did not impress, at that time, have improved (a good example is Moishes. I respect Moishes because they respond gracefully –a breath of fresh air in an industry where ego is generally out of control — to constructive criticism by adapting to constructive change). Montreal is not a city for steaks (our strenghts are the smoked meat, the bagel, the cheesecake, to some extent the poutine but that is unfortunately less and less the case in Montreal). The scores you’ll see below are scores limited to Montreal steakhouse standards. If I had to start comparing those with the finest in the US, just as an example, the scores would be even lower. Let alone, the finest Argentinian, French, Japanese, Australian, Spanish cuts of meats that are virtually not present in Montreal while remaining high on the list of this globe’s most praised meats. Montreal has couple of steakhouses that are widely known as the finest of the city. The most famous of them all is La Queue de Cheval of charismatic restaurateur Peter Morenzos. Other highly regarded Montreal steakhouses are Rib n Reef, Moishes, 40 Westt, Gibbys. Choices of meat do not vary that much: mostly Black Angus from the US, occasionally some cattles from Alberta and recently some Australian Wagyu. Of course, Montreal has other chopshouses but those are the ones generally regarded as Montreal`s finest. I had my first steak at a steakhouse in 2009. Since then, I have enjoyed plenty of stellar steaks ( Argentinean, Scottish, US, etc ) . At this point in time, my preferred rib eye steak is the like of a corn-finished 40-45 days solely dry aged Black Angus, bone-in, backed by rigorous sourcing and an exceptional understanding (from my butcher or steakhouse) of what makes a prime cut really great ( for eg, using the best aging technique for X cut, understanding the importance of the health/diet of the beef/the proper slaughtering technique/proper hanging technique, etc –when you are obsessed about doing things right, it never fails to be noticed by a diner who prioritizes quality). I am impressed when I see a butcher or steakhouse concerned by the traceability of their meat. In regard to the reviews you will peruse,below, I’d like to remind that the sole intent of my scores is to convey what I have perceived as closer to / or far-off my preferred type of rib steak,and they (my scores) should not be interpreted as a way to assess one steak as superior to another one (those steakhouses would not be in Business for so long if they were serving bad steaks, so rest assured that none of them had bad steaks). Obviously, food assessment is utterly subjective (solely based on personal expectations), so consider my ratings as what they are, and not what you want them to be. IMPORTANT: Most steakhouse staff in town is unable to inform about the exact cattle as well as the farm where the beef was born,which is why you’ll notice that I always mention the grade of the beef, but virtually no info about everything else. That is something to improve upon as being knowledgeable about traceability is a way to show respect for the food you are serving. ***Recent steakhouse review (Sept 2014): Steakhouse Vertigo Stk (click here for the review). La Queue de cheval (aka the Q http://www.queuedecheval.com) is an iconic steakhouse in Montreal. There has been a split, recently, which resulted in the Q moving from its original location (they were on 1221 Rene Levesque Street ) to a temporary spot (1234 De la Montagne, but they are planning to relocate soon) and the other half of the team remaining where they used to be (now re-named Steakhouse 1221). If you are curious to know where Montreal’s legendary restaurateur Peter Morentzos did end up, the answer is that he is the strongman of the Q. The Q is pricey, therefore I can’t afford heading there on a regular basis. This being only my 2nd visit in 5 years. But not many steakhouses in town offer the quality of beef and the proper depth of knowledge/expertise you can find at places like this, therefore I find it justified to splurge once in a long (only when I feel like really enticed at the idea of dining out at a top steakhouse ) while on Montreal top steak contenders (Moishes, Gibbys,Rib n Reef, Queue de Cheval). In a long long while. At their current temporary location, there’s a tiny bar made of marble as well as a relatively small dining room that they share with nightclub 1234 (another reason I chose to eat there earlier in the evening). I sat at the bar, which ensured a completely different ambience from my last visit here (last time I was at the Q, I was in their grand dining room on René Levesque), with my waiter, Thomas, offering stellar service where professionalism and warmth is perfectly balanced. Thomas is a charismatic gentleman of the type you occasionally encounter at few grand dining destinations. Picked their classic 20 oz bone-in Lou cut’s rib steak (I chose the corn-fed Colorado’s Black Angus USDA Prime cut as opposed to the mostly grass-fed Kansas cuts / At touch, smell, and look, I can and always judge the dry-age of a meat myself, and my cut had less than 30 days), the precision in cooking absolutely faultless with that steak I was having: medium rare as requested, medium rare is delivered. The good marbling delivering enjoyable steak flavor, the usda prime quality being indeed a cut above most of the non usda prime versions found at most steakhouses in town. Objectively a good steak by upscale steakhouse standards in Montreal. The problem with the Q, based on my visits here, is not a problem of quality nor cooking skills (the problem, as with most upscale steakhouses in Montreal, is $$$). As an example, their take on the tiramisu (it’s their take on it, so do not expect comparisons to traditional Italian versions of the Tiramisu) was delicious, technically well crafted. The Brazilian coffee done properly, the salad fresh but over-overpriced for what it was. The problem, as it’s oftently the case with upscale places like the Q is the price. I do not disclose details about the amount of my bill, since I value such infos as purely personal, but their prices can be found on their web site. It is admittedly always hard to tell whether a steakhouse of this standard worths all that money. No one will ever have the absolute answer, anyways. But it’s not rocket science to fire a great steak in a back yard, so buying a great aged steak at my butcher remains the best cost effective option. What I insist on doing, though, is to avoid mixing up the effect that prices have on our judgement with the real appreciation of what I am eating. With price in mind, I have always valued 95% of the dine out scene to be widely over-rated. So if I decide to dine out, I am looking for other factors to fill the gap: in this case, the expertise/knowledge about their meats, the way they age them, etc. Things that move me out of what I’d be able to do at home: I can cook a steak at home. But I do not age steaks. So I opt for the cuts they’ve invest the extra mileage I could not. Corn? Grass? Matters less than factors such as the breed and skills/care of the farmer, but this was corn-finished and as such, it only makes sense that cattles feed mostly on grass. Do they have a mostly grass-fed cut? YES, their Kansas cut. 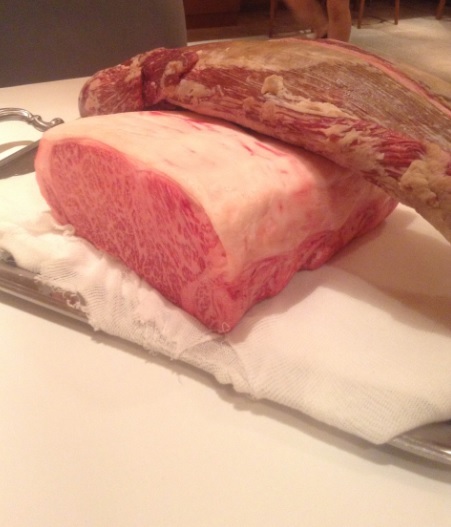 Absolutely, the seriousness/care, dry-aging, sourcing makes this one of the finest steakhouses in Montreal. Just don’t draw comparisons to the finest of NYC, for example. 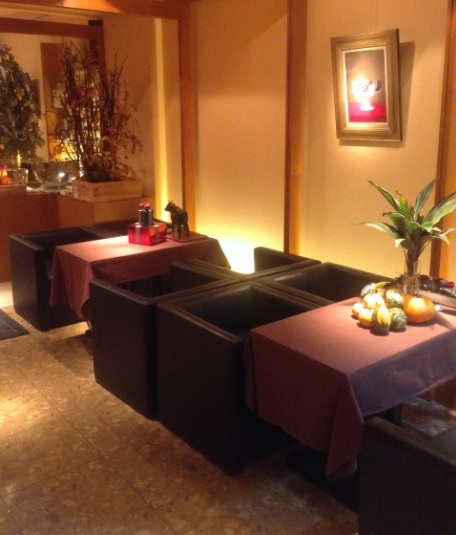 Service: Thomas is simply one of world’s best in the hospitality business. What I liked: (1)The world class service of Thomas (2)The opportunity to discuss steak with a knowledgeable staff (3)Because it was early and there were not many people, the ambience felt intimate (3)Although limited in variety, the wine by the glass was relatively decently priced by upscale steakhouse standards in Montreal. 1221 Steakhouse (http://www.1221steakhouse.com/ ) is the other half of what used to be la Queue de Cheval. So after visiting their other half, La Queue de Cheval on De la Montagne, I paid a visit to them. I was particularly curious to see the difference between their rib steak, especially since both teams have benefited from the same knowledge, for so long and the split is just recent. Upon visual inspection, indeed this had proper USDA Prime marbling distribution. Corn? Grass? Matters less than factors such as the breed and skills/care of the farmer,but this was corn-finished and as such, it only makes sense that cattles feed mostly on grass. fearing that my bill would reach skyrocked highs, especially with the price of wine, I did put a brusque halt to any extra splurge, so no dessert, no coffee, nothing else . Instead of treating me in a snooty way (especially with the close table of wealthy gentlemen feasting on caviar, lobster and champagne), he was as caring to me as he was to his wealthier patrons. Hard to not like a service like this. What I liked: (1)The classic steakhouse decor with the aged steaks displayed at the entrance, the warmth of black stones mixed with rustic wood. This place is big and special in its own way (2)I was lucky to stumble upon that 40 ++ days aged cut. It made quite a difference: as expected, a tad more concentrated in beef flavor than the cut I had the day before at the Q, the flavor benefitting for the expected extra concentration of meat flavor. It was on its way to develop the nuttier aromas of some exceptional dry-aged cuts, therefore really a cut packed with character in the aspect of texture in particular. The kind of cut that calls for a pause, then admiration of the work behind it, then you can start devouring, Rfaol! Deserves its rank as one of the finest few steakhouses in Montreal: In my opinion, No. A rib steak is the easiest cut to work with. Bold beefy flavors is its raison d’etre. You say rib eye, you automatically think rich meaty flavor. It has to dazzle. I did not like: My steak! For me, this 3 weeks boneless rib steak (no bone-in rib eye at a time when bone-in rib steaks are all the rage?? Something is sure, the waiter told me there was no bone-in rib steak when I asked ) was not even close to the character of the finest bone-in wet age steaks of 30 to 40 days I enjoyed either at Montreal’s steakhouses or bought from local butchers. Which took me by surprised given the praises over this steakhouse. What I also found disconnected from the praises seen everywhere on the web (btw, I too do love Moishes but I can’t pretend that this is the finest steak or among the finest I had in this city. It’s simply NOT the case, as far as I am concerned) is the opinion about the side of baked potato. It’s Ok, not stunning and eventhough there is a lot of babbling about chain steakhouses being poor, I have to say that at the end of the day I can only deal in facts and that the baked potato of a chain like the Keg has pleased me far more than this one I was having at Moishes. I also enjoy being presented with my steak before it goes to the grill, a piece of theater that adds to the experience of a grand steakhouse dinner and that I did appreciate a lot at places like the Queue de Cheval and 1221. That did not happen on this visit. Same for the wine by the glass (the glass arrived with no presentation of the bottle). I am not one who will force his imagination to let prices affect my appreciation of things, so never rely on me for such things like value (although I know very well what might perhaps be cost effective or not), but prices aside (For the record, this steak at Moishes cost me almost the same price at the Q or 1221), my steaks at the Q and 1221, during this round up, were easily 2 cuts above my steak on this meal at Moishes. Rib’n Reef (http://ribnreef.com/ ) – In Montreal, you basically have two leagues of steakhouses : one that’s known as the upscale steakhouses in the city (Rib’n Reef, Queue de Cheval, 1221, Moishes, Gibby’s, 40Westt) and the other one comprising of the likes of the Keg, Maddison Grill, Houston, etc. Again, which one is better will come down to what you are looking for. I have no judgement other than recommending that you try them all and see what matches your expectations. A personal matter. As for me, I took my hard earned money and went to find for myself since I want to know where I can bring my wife or what to recommend to close friends and relatives. In the process, I am just sharing what I think with you. This time, I visited R’n’R. R’n”R interior is relatively vast, with several sections: for eg, classic dark wood dining areas, cigar lounge, rooftop terrace, etc In order to compare apples to apples, I pursued with the same cut (rib eye steak) I chose at other reviewed upscale steakhouses (Queue de Cheval, 1221, Moishes are already reviewed in current post), at exact same doneness: medium rare. Prices for a rib eye steak of mas o menos similar size (for eg, 20 oz at Queue de Cheval and 1221 / 18 oz at R’n’R) is almost the same at all the upscale steakhouses of Montreal (approx 55$). Deserves its rank as one of the finest few steakhouses in Montreal: For me, Not for now. But this place shows a lot of pride and will to improve that I trust its rib steak could one day reach the standards of those of La Queue de Cheval or 1221. What I liked: (1) Daniel’s incredible service (2)At Moishes, I was impressed to see that they served pickles, bread, coleslaw. Sounds like nothing miracular, but you won’t see that oftenly in Montreal. But Rib n Reef went even further. They served those same items (coleslaw being superior at Moishes, in my opinion and the pickle as plump and of remarkable quality, except that Moishes served more of them), and completed the meal with even some cookies. Not the beginning of a new life cycle, rfaol, but a rare touch at a Montreal steakhouse. What I did not like: I love my steak thick, exactly as what they served at 1221 and the Q. For me, a good 2′ thick inch rib eye steak opens my appetite, it locks more juiciness/tenderness. Theirs was about 1′ inch thick (or slightly more, but slightly). I also like when you show me the steak prior to grilling it, which they’ve omitted on this instance. Last but not least, this rib steak was certainly nicely aged, but not to the point of reaching the close to gamey/nutty character of the steaks I had at the Q or 1221. The wait staff explained that it was wet age then dry aged . If that is the case, then perhaps just dry aging it all the way would be more successful. Final Notes: A classy steakhouse, which has not impressed me with its rib steak on this visit, but that remains promising (I’m always amazed to see people who are always curious about getting better). -When you are a rich , I’d guess price never matters. But I am not, therefore for my money, proper sourced and aged cuts at a reliable local butcher wins. -Which steakhouse is the best in Montreal goes down to trying the finest ones (Moishes, Gibbys,Rib n Reef, Queue de Cheval, 1221) and see which one matches the best with your expectations. In my experience, Montreal finest steakhouses is a cut, a times two cuts, below their competition in say, the US, Spain, etc.